Industrial yarn is designed and engineered to be incorporated into products where oftentimes, a functional requirement supersedes aesthetic considerations. Used by non-apparel industry product manufacturers, industrial yarns are typically a component part of a product to enhance the strength, durability, performance and other high-value properties of the product. Product manufacturers in industries such as wire and cable, web slings, industrial bags, geotextiles, hose reinforcement and many more, are using tons of yarn on a yearly basis - however, it is not uncommon to find that the end user’s yarn specifications on paper do not match the physical product being used. Most end users of industrial textiles lack the laboratory equipment needed to test all the physical properties to the paper specifications which makes the accuracy of a specification and the material being supplied even more critical. It is important to have a supplier that can conduct regular and thorough testing of their product and can consistently meet specification requirements. What key components should be included on an industrial yarn or thread specification? Yarn size – this could be listed in denier, decitex, tex, cotton count and a variety of other measures. 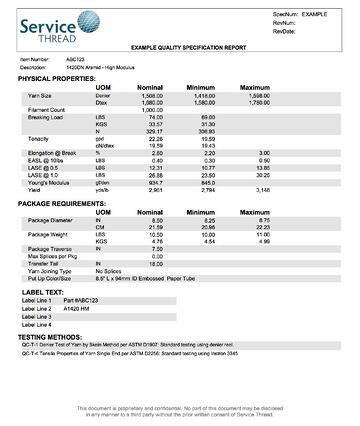 The yarn size ultimately determines the yield of the product. Fiber Type – Clearly state the fiber type such as polyester, nylon, aramid, polypropylene, polyethylene, or specialty fiber. Also include important characteristics such as whether the material should be high tenacity, low shrinkage, or high modulus. Where possible, try not to include a specific merge or lot number of raw material as that can limit available options for substituting equivalent products. Heat shrinkage / hot air shrinkage – This is specifically important for rubber goods that need to be vulcanized, but can also apply to other applications where the material is exposed to high heat. If yarn shrinks too much, it can draw down the diameter of a hose or affect how the yarn would lay in a belting application. Tube size / cone size – it is important for yarn to be wound on the correct size tube or cone to fit on your equipment. Critical characteristics for sizing include length, inside diameter, and thickness. Additionally, it is helpful to know if you require transfer tails to enable continuous runs or if there are any yarn joining methods that can be used. Test methods that can be reproduced – it is imperative that test methods align with ASTM standards so they are reproducible, accurate and in compliance with a yarn’s specifications. If your test method includes wrapping a yarn around your hand a couple times, you’re not alone. However, this is not an accurate test method and can leave room for error and inconsistencies. If you don't have specifications for some of your products, your industrial yarn supplier should be able to provide a detailed specification or be able to create one for you based on one physical sample package. Service Thread supplies multiple industries and has broad knowledge about yarn and fiber application best practices. Our expert yarn engineers can help review the accuracy of your specification and recommend the best industrial yarn product for your end use. Contact us to find out what fiber type and product construction will work best for your application.